I’m old enough to remember the Nintendo video game; that’s where I learned to spell Schwarzenegger. This film was a big deal in the late 80s, and even into the 90s; Arnold was an action star on a level of which I’m not sure we’ve seen since. Not in pure, unmitigated, unapologetic adrenaline anyway; modern action movies seem to be focused on ridicule and farce instead. Very recent action films have pushed toward actual, high-quality entertainment (take Fury Road for example), so maybe there’s some hope, but there’s still no dude like Schwarzenegger. He was big stuff, literally and figuratively, a colossus on screen, and it didn’t matter that his accent was weird or that his acting wasn’t amazing, we loved watching anyway. Thankfully, Predator revisited is just as awesome as Predator remembered. When the US government finds themselves in a tricky situation in a foreign jungle somewhere, fighting guerrilla soldiers and propping up a friendly dictator, they call in Dutch & his team of special ops, because they know he can get the job done, no matter how messy. Dutch has been in many a tough spot, has blown his way out of many a deadly trap, and can be trusted to get in & out quickly without exposing his government to political fallout. His most recent mission is to extract hostages from deep inside a South American rebel camp, or so he is told. But there’s more going on than meets the eye, as Dutch’s old buddy Dillon well knows, since he’s no longer a soldier but a CIA operative. He’s not telling the team the whole truth, and even he doesn’t know that there’s a wild card roaming the jungle, a hostile, other-worldly entity that means to kill every human it meets, regardless of which side they are on. 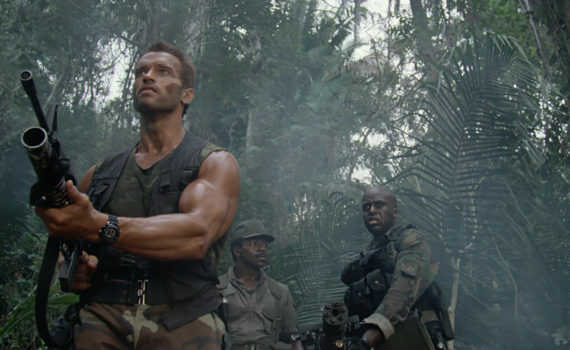 Predator is Rambo meets Alien, which is exactly as cool as it sounds. Don’t think about it too much, or you’ll end up liking this movie less, since it’s an obvious and laughable theft of plots that have come before. But although that’s undeniable, it’s also somehow forgivable, because the melding of these ideas led to a film that would become a decade-spanning franchise, which is hard to fathom in itself, since the original is so trashy (in a good way). It’s bloody and gross and violent and creepy and cool and muscular and you can almost smell the heated gun metal, which was pretty amazing when I was a kid, and really hasn’t lost much of its glory in the years since. Arnold is terrible/great, Carl Weathers is a fine good/bad guy, the side soldiers are a bit throwaway, but somehow they work as a unit. The music is incredible, I had forgotten about that, creating a perfect mood from start to finish, and the scenery works wonderfully with the plot, every fern fan a potential hiding place where death might be lurking. Predator is a cult classic that spawned generations of mimicries, but it stands out and holds up in a way the others can’t, with a nostalgia for the era that makes me want to binge-watch.